I was really just craving a burger. And being homebound, I needed to come up with one that would satisfy that craving, but still be something we could prepare without the grill. And then, what to have for the side dish, knowing I didn't want to have a bun or bread component with this meal. I started thinking about side dishes we have had in restaurants that stood out for me, and I remembered this tabbouleh from the Mediterranean Cruise Cafe in Burnsville. We liked it because of all of the fresh herbs, and the strong lemon taste, so I set about creating it at home. I love quinoa, but I purchased this enormous bag of it, so we literally have enough for a year. 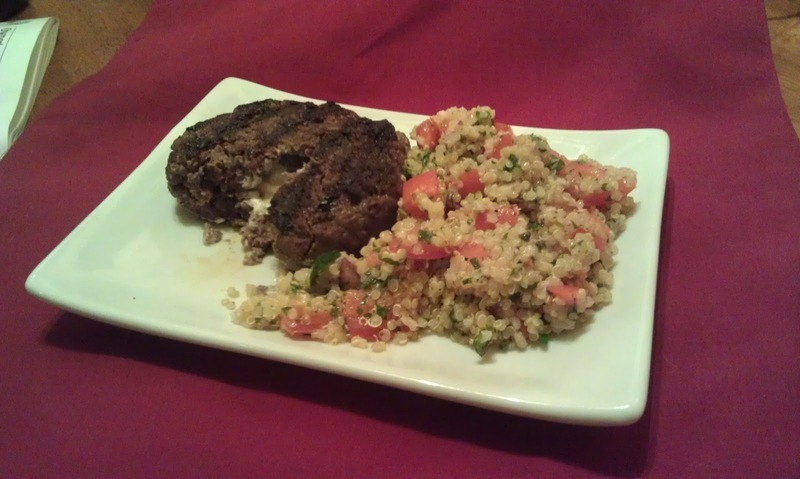 It seemed to me that I could use the quinoa in place of the couscous that was in the original dish. I just made a guess at the herbs, but I will keep this version, it was so light and zesty, a perfect match to my goat cheese stuffed burgers. Place quinoa, water and salt in saucepan and bring to a boil. Reduce to a simmer, cover and simmer 10 minutes until quinoa breaks apart into curls. Remove from heat, let cool, then place in refrigerator to chill 2-3 hours. Whisk together lemon juice, garlic and olive oil, set aside. Add herbs, tomato and onion to quinoa, and drizzle half of the dressing mixture over. Salt and pepper, then taste. Add remaining dressing to your taste (we liked it all on the salad, but realize it may be a bit much for some). Mix the Greek seasoning into the meat, and form into 6 equal patties. Place a slice of goat cheese in the center of each of three of the patties, and top with another burger party. Make sure edges are well sealed around the cheese. Place on a hot grill or grill pan, and cook 4-5 minutes per side. Serve with salad.